Falls on the eve of Republic of China a hundred years, in response to "Republic of China Foundation for a hundred years" and "Council of Cultural Affairs, "and with the government and private resources, brainstorming, consensus, plan to celebrate the founding of a century-related activities Atmosphere to the formation of public participation, to achieve unity and harmony to promote and strengthen national identity and promote people of great importance to the founding of a hundred years, and work together build a beautiful vision of the goal. 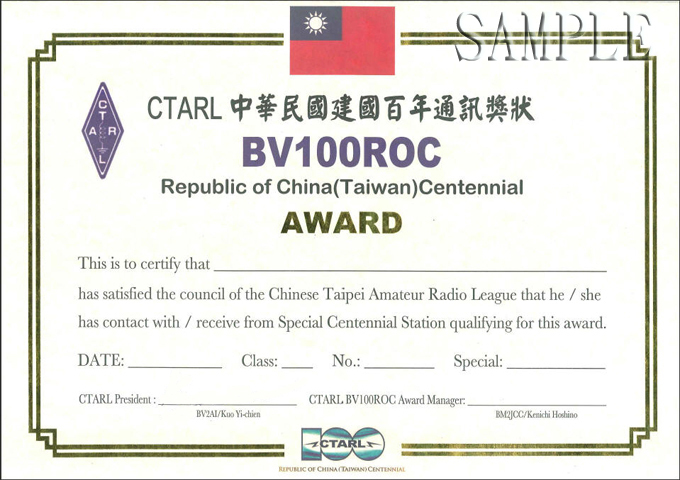 This will tie in "Republic of China great hundred" series of activities, in particular to the "National Communications Commission " filed on behalf of "Taiwan" in the nine different founding of special memorial call sign, and planning "to wave around the world, let the world hear Taiwan "The centennial of founding a series of radio amateur radio activities, the time from June 1, 2010 to December 31, 2011 only, while " Tourism Bureau "also provide related support to highlight the Republic of China (Taiwan), a series of QSL cards printed promotional photos photography, amateur radio communications to enhance not only the use of foreign nationals, but also through the exchange of QSL cards and thus promote the Republic of China (Taiwan), and the century of the event will also be issued communications awards, you are Welcome to eligible for the elements of the application request. 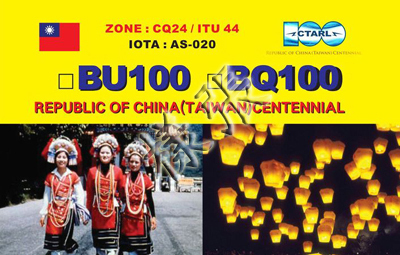 6、Centennial station of the Republic of China <QSL Log Inquiry System>. 7-2、Operator please use the N1MM Log software for Adif format. 7-3、 Log will be arranged monthly for E-Mail to BM2JCC ：bv100roc@ctarl.org.tw ,to build a unified database for the query. 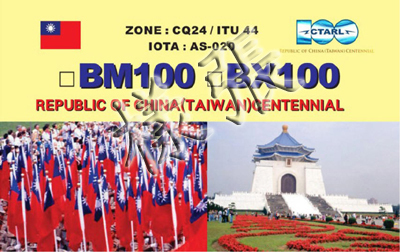 7-4、Base on Log data,"Wonderful hundred QSL card "will be compiled and unified response cards by BM2JCC. 7-5、CTARL Buro : P.O.BOX 73 Taipei, Taiwan. 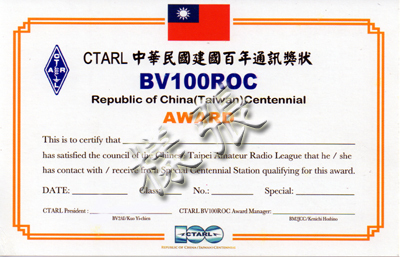 8、Centennial station of the Republic of China (AWARD) Issue: Person in charge is in accordance with founding centuries of communications application rules for certification after application by the applicant. Application fee: US$3 or 5 IRCs (overseas applicants). 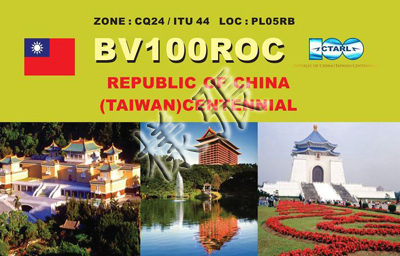 Eligible QSOs/reception reports must be with/of these ROC centennial stations:"
Bronze︰ QSOs with/reception of BV100ROC or 2 other ROC centennial stations. amateur radio frequency or mode within the dates specified above. Thank authorized "Wonderful hundred QSL card " event photos to use! Thank authorized "Wonderful hundred QSL card " Logo to use! Thank sponsored "Wonderful hundred QSL card " event Logo! Thank build "Wonderful hundred " Log database. Thank sponsored "Wonderful hundred QSL card " for printing, NT$：10000. Thank sponsored "Wonderful hundred QSL card " for printing, NT$：50000. 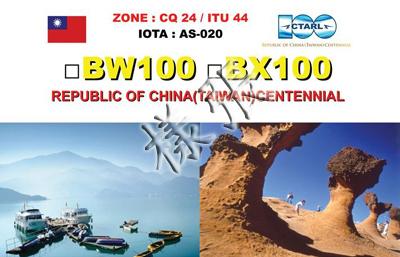 Thank sponsored "Wonderful hundred QSL card " for printing, NT$：2000. Thank sponsored "Wonderful hundred QSL card " for printing, NT$：5000. 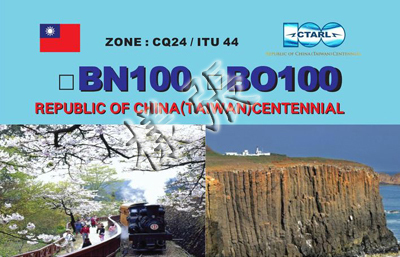 Thank sponsored "Wonderful hundred QSL card " for printing, NT$：3000. 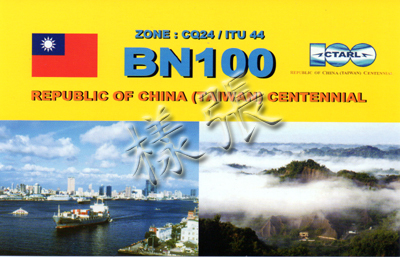 Thank sponsored "Wonderful hundred QSL card " for printing, NT$：900. Thank build "Wonderful hundred " English Web site. Thank build "Wonderful hundred " Japan Web site.